While charging ahead to become the world’s second largest economy by gross domestic product, China devoured a massive amount of all kinds of metals, fuels, and crops from around the world. Australia, along with countries in Africa and South America, built its own dreams of prosperity on China’s rapid growth. The present recession in China therefore affects not only Chinese people but also dozens of developing countries prepared to sell mineral resources to China. Over the past 20 years, China has transformed from playing a marginal role in the world economy to becoming an engine pushing the economic growth of many countries. “Engine,” in this context, does not refer to the cheap “Made in China” products, but to China’s increasing need for resources that led to development in these places. Through this, China has become the world’s largest buyer of resources and agricultural products. In October 2013, China officially replaced the United States as the world’s largest net oil importer, surpassing the United States’ imports of 624 million barrels per day. Nearly 60 percent of China’s oil consumption depended on foreign oil. In addition, about half of the world’s pork was consumed by China. In 2014, the European Union’s pork exports to China increased slightly to 368,700 tons, amounting to 65 percent of China’s pork imports. The main EU pork exporters to China are Spain, Denmark, Germany, and the United Kingdom. China also imports large quantities of wheat from Australia, the United States, and Canada. Soy is a major source of China’s vegetable oil. Its soybean consumption accounts for 22 percent of the world’s. China mainly imports soybeans from the United States, Brazil, and Argentina. China’s economic recession has resulted in a decrease of its purchasing power. With economic globalization, not only are businesses in China impacted, but so are the countries that supply resources and agricultural products to China. Australia’s economic boom and decline over the past years are closely related to China and involve a very wide range of goods. China’s main imports from Australia include iron ore, wool, steel, crude oil, aluminum, and more. Because manufacturing is not very developed in Australia, it’s also an important export market for China. China’s export commodities to Australia include textiles, garments, and light industrial products. Australia has always been one of China’s top 10 export markets. At the peak of China’s construction boom, its huge demand for iron ore caused many countries to increase their iron ore production. As the world’s largest iron ore importer, China purchased iron ore from 18 countries, with 80 percent coming from Australia, India, and Brazil. Therefore, calling China an “engine” of iron production was not an exaggeration. 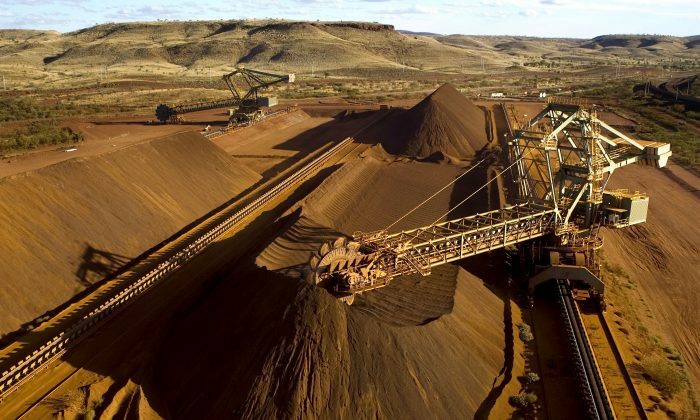 Western Australia is dubbed “China’s quarry.” As a mining state, Western Australia enjoyed a 10-year economic boom through the sale of iron ore—the main raw material for making steel—to China. The price of iron ore reached its peak of $190 per ton in 2011. It has now fallen more than 70 percent to about $50 per ton. The price drop reduced tax revenue for local governments and forced small-scale mining enterprises to close down, with thousands of employees being laid off. For the past 10 years, China has made very large investments in Africa. On average, other countries invest about six times more in the United States than in Africa. By contrast, at the end of 2013, China’s investments in the United States reached $22 billion while its investments in Africa totaled $26 billion. Beginning in 2000, China became Africa’s largest trading partner. During the 1990s, trade between China and Africa increased by 700 percent. From 2000 to 2012, it grew by more than 1,000 percent, from $10 billion to $200 billion. During this period, the average annual growth rate of African economies increased from 0.6 percent in the 1990s to 2.8 percent in 2015. As of 2012, South Africa obtained over 20 percent of China’s $4.8 billion direct investment going to Africa. China’s direct investment to the top five African countries increased from $317.2 million in 2004 to $11.2 billion in 2012, a 35.5-fold increase. Rapid economic growth in sub-Saharan countries gave local people cause for hope of a new era of prosperity. Some people even believed that these countries’ economies would no longer have to rely on the world’s unpredictable demand for raw materials. One such symbol of prosperity was Africa’s first modern, Chinese-built railway that traversed through Nigeria at the end of 2014, to the delight of the Nigerian people. However, with the slowdown in China’s economy, Chinese demand for African commodities also decreased, and the economies of many African countries also rapidly declined. The economic prospects for the African continent have now become grim, especially for its two largest economies, Nigeria and South Africa. With China’s imports from Africa plummeting by nearly 40 percent in 2015, the currencies of Nigeria and South Africa fell to a record low this month. South Africa, the largest African iron ore exporter to China, is suffering from the downturn in mining, manufacturing, agriculture, and other sectors. Nigeria, the largest economy and oil producer in Africa, is shocked and confused by the collapse of crude oil prices. With a currency that has been decimated, it will be more difficult for Nigeria and many other African countries to repay their large Chinese infrastructure and construction loans. Australia and African countries still hope that the Chinese economy will pick up again. However, the reality is that China must adapt to the “new normal” state of economic recession and prepare for tough times ahead. For countries that have depended on China’s demand for large amounts of commodities, it would be best to redesign the blueprints for their own economic development. Placing hopes for prosperity solely on another country’s short-term demand for commodities is a very fragile state indeed. This is an abridged translation of He Qinglian’s Chinese article posted on her personal blog on Feb. 5, 2016. He Qinglian is a prominent Chinese author and economist. Currently based in the United States, she authored “China’s Pitfalls,” which concerns corruption in China’s economic reform of the 1990s, and “The Fog of Censorship: Media Control in China,” which addresses the manipulation and restriction of the press. She regularly writes on contemporary Chinese social and economic issues.